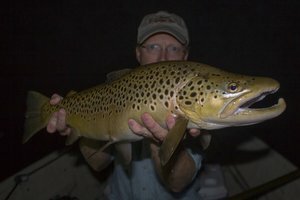 If you read my blog throughout 2008, then you are aware that I spent a fair amount of time chasing various warm water species. A lot of that time was spent below Chickamauga Dam on the Tennessee River searching for striped bass or whatever else would hit. I always had to settle for the "whatever else would hit," and while it was great adding several new species to the list of fish caught, I really wanted to get that striper. 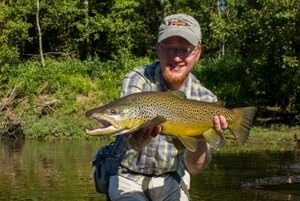 Recently I had a buddy call me up and tell me that he had caught his first and that I should try it out. 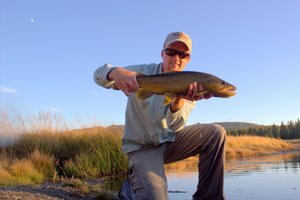 At first I hated the thought of making the drive from Crossville, but subsequent stories of nice fish and a few pictures to back them up convinced me that I had to try. Earlier this week I headed out in the late afternoon for an evening of fun, fishing, and hopefully my first striped bass. The drive went by fairly quickly in my excitement. I rolled up to the river just ahead of my buddy and started rigging up as I waited for him. When he got there, he took me down to the water and showed me the good spots. We started to see the occasional boil that told us something was chasing baitfish. I couldn't wait any longer and started casting. After what seemed like only a few minutes but was probably more like 20 or 30, I felt a hard bump and set the hook with authority. Immediately I knew that whatever I was attached to was much stronger than 99% of all other fish I've ever hooked. I was fishing my 7 weight, and the fish was still very much in control of the situation. Minutes later I finally saw the fish and realized that my long search for a striper was over. Hey David. Out West, our Striper run was short. We're waiting for the Steelhead next month. You caught a couple of nice ones. Way to go. 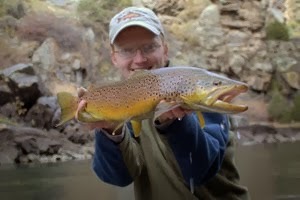 Hey David - In in a similar situation - I normally target trout on the Clinch and the Hiwassee. 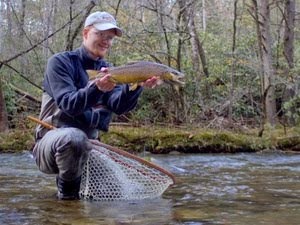 Here lately I've been trying to hook up a striper on the lower Hiwassee - I've heard they are lot's of fun on a fly rod. So far I'm catching respectable smallmouth bass on flashy streamers. Any chance you'll post a photo of the fly that was working for you?